In October we visited the Hill Ridge Farms in Youngsville, North Carolina for the fall activities. During our visit in October, we bought All Inclusive Superpass for $25 which includes unlimited train rides, hayrides and lot’s of other activities along with a FREE ticket for a return visit to The Festival Of Lights. I mentioned in my earlier post when we did the fall trip that i would be writing about our visit during the Festival Of Lights, so here I am. We decided to go on a non peak day which was November 25th, but when we reached there, we noticed there was a huge queue for the hay ride. We stood in the queue for approximately 45 mins to an hour and then went on the most wonderful hayride. 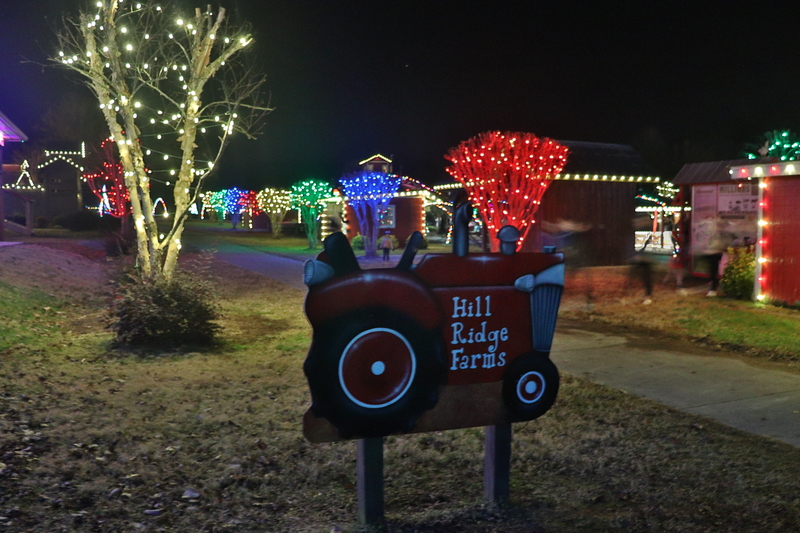 The farm lights were so beautifully done, all the songs which were playing during the hayride were synchronized with the lights displayed. The lights and music made the experience so wonderful. Ayrah had such a fun time and she enjoyed watching the lights while on the hayride. After the hayride we went and roasted some marshmallows & made some s’mores. Ayrah loved standing near the bonfire and kept saying “hot hot” …Also since it was pretty cold out there, the bonfire felt amazing and the s’mores were icing on the cake! The play areas were open for the kids and were included with admission, there was a jumping pillow, pipe swings, etc. Did i mention there was Santa too? How can we not have Santa at a Christmas event? Though the Santa was at the farm, we were quite late and unfortunately didn’t get a ticket to meet Santa. No worries, we love Bass Pro Shops and their Santa too! After spending sometime near the Bonfire and having a great time, we saw that there were very few people going for the hayride. We decided to go again. This time the ride felt even more beautiful and we enjoyed every moment. The excitement in my toddler’s eyes and the happiness on her face made the trip worth it! I would definitely go to The Hill Ridge Farms again in the future. This is by far one of the best farm in North Carolina. The Staff is always welcoming and friendly. One of our happy places for sure! What are your plans for the upcoming cold nights? We are heading to India in a few days and we couldn’t be more excited, but meanwhile i’ll probably make some hot chocolate, sip it and try to blog more regularly! Do share your favorite places to visit and things to do during cold nights! Sounds like a fun festival! Love the photos!